This is a not-fun post, but it is really something that needs to be addressed before we go any further. Party planning is wonderful, as is throwing parties, but it is not a free hobby. I won't say I would never consider being a professional party planner, because I don't know the mind of God, but I will say this: you would have to pay me * a lot * to do something like this! I do it because I love the person-otherwise there have been some moments that I would have needed some serious cash incentives to carry on. I have learned everything by trial and error-and budgeting hasn't been any different. 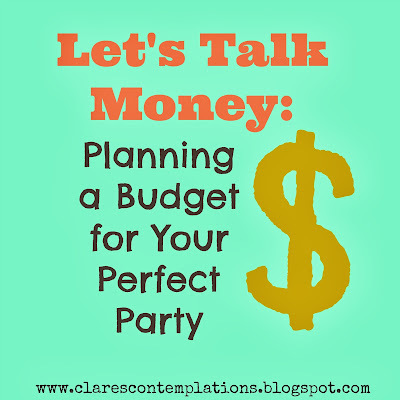 It isn't fun to talk money, but it can make or break a party. And I don't mean that you need to spend wads of cash! But you do have to have a plan, and there has to be some give and take. I have thrown many parties for people who aren't family (there have even been a few that I don't know that well) and it would frustrate my husband to no end if I spent thoughtlessly, since parties are a fairly regular occurrence in my life. 1. Set a target budget. Some things to consider are: Will you have to buy any new tools? (Things you can reuse but are more expensive like punches, dishes, etc.) How many people are you planning on? What parts of the party are you responsible for? Are you hosting solo, or are you only taking care of a part, like decor? Are you planning a meal, or just snacks? I usually am in charge of everything, except the food. If it is a smaller party, 5-8 people, I will plan on spending between $25-$40. If I was providing the food, I would bump that number up by at least $15, definitely more if I was planning a full meal. If it is a larger party, I will usually figure between $50-$100,for 10-20 people, although I am very grateful to have a sweet friend who works with me who basically splits the cost. That number doesn't include food, either. As the size of your party increases, you will have to increase your budget, obviously! 2. Find ways to cut costs. I will talk more about this later, too, but for now start to think about how you can save money. Can you borrow items? Can you use a coupon at a craft store, or wait until an item is on sale? Hobby Lobby is very consistent with their sales, so pay attention and it will be easy to know which weeks ribbon is 50% off, and which weeks its scrapbook paper! Can you ask someone else to be in charge of a certain part (favors, bringing food, party games) so that you can share some of the cost? 3. Decide on what elements of your party you are the most concerned with. Is it having fabric tablecloths? Is it using real dishes? Is there an item on Etsy you have had your eye on? Purchase those things first, but be willing to "cut corners" elsewhere. I suggest that you pick your top three items and work from there. 4. Make sure you allow yourself some wiggle room. Set your budget a little on the low side, so that if you find that "perfect" thing, you won't have to say "no" because you have already spent your wad. And if you don't find anything extra, you will have saved yourself a little cash! I would say, aim to spend 80% of your number- mine is usually a range, like above. If I am planning $25-$30, I will allow myself to go up to $35 without feeling guilty. 5. Don't tell yourself that a better party is directly tied to more money. You can have a fabulous party for $25, but you have to be smart about it! You also have to be willing to put forth a lot more time and effort than it would take to just buy everything. 6. Start your planning early. It will be much easier to watch for sales, and find good deals and thrifted items, if you have more than a week or so. Also, it will allow you more time to network, asking people to help out, or borrow items. 7. Don't stress! You can do this, no matter how much, or how little, you have to spend. It will actually put your mind more at ease once you have decided what you are spending. If you need a better idea of what things will cost, go on a window-shopping trip. Scope out the cost of paper, and fabric, tableware and food. I have bought enough scrapbook paper, embroidery hoops and wreath forms that I have a pretty good idea, but if you don't do this often it will be worth your time to go on a fact-finding mission without committing to purchases. 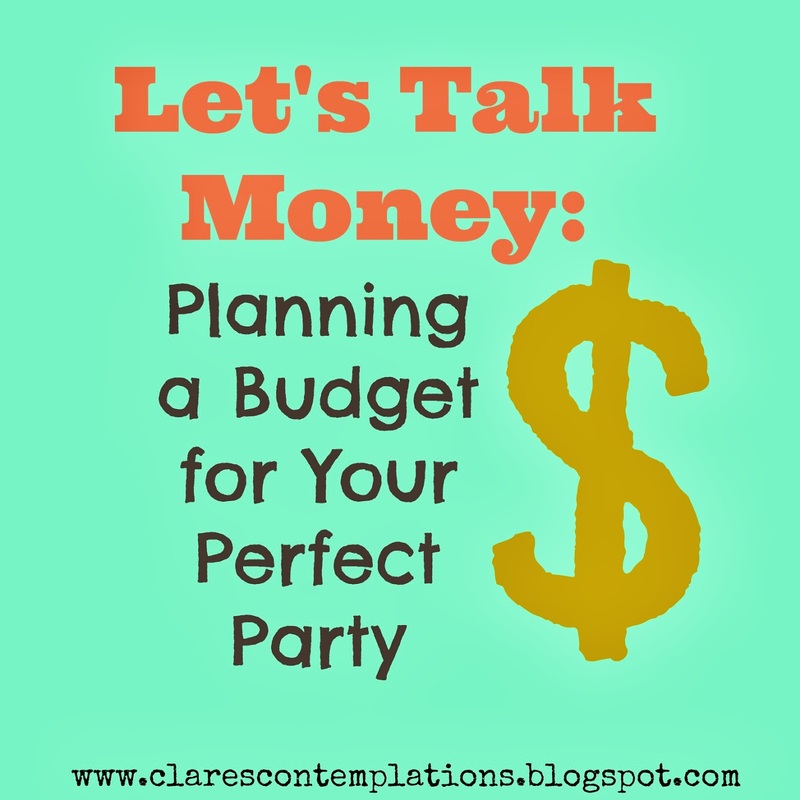 So make a list of your party elements (if you need a reminder, see my list here), put a number beside each item, add it all up, and you have a starting point budget. You can pat yourself on the back-one of the least fun party tasks (but one of the most important!) checked off! This is Day 11 of "31 Days of Perfect Party Planning". See the rest of the posts here. More $$ definitely doesn't account for a better event. I've seen multi-thousand dollar weddings that paled in comparison to Kate's - largely because they invested in the venue for little pay off IMO. Definitely don't charge people for the party. And don't get me started on this. Without saying too much and incriminating myself, let me just state that when hostessing a party, if you can't afford it, get more hostesses. Don't charge the guests. And yes, I've been invited to a shower where there was a 'cover charge.' TACKY!!!!!!!! !